Even in the 1950s Ford was still using the Sidevalve (or L Head) in the 100E even though the volumetric efficiency was low. The Mk1 Cortina used an OHV design called the bathtub combustion chamber, which was more efficient, and then for the MkII Cortina opted for the Crossflow head, another OHV design in which the inlet and exhausts were one opposite sides of the engine axis. 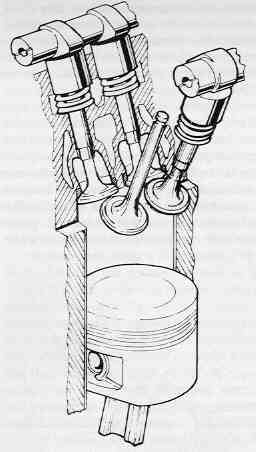 In both of these the camshaft was installed in the crank case and operated the valves through pushrods. Then came the Pinto and the CVH engine, in which, at last, one cam was raised over the cylinder head, but this was still a compromise. For reasons of cost and complexity, although these combustion chambers were more efficient, they were still not a Pent Roof design. To keep the cost of the engine down, new composite fibre belts were used to drive the camshaft, and woe betide the owner who did not change them before 60,000 miles (or less.) Nevertheless, they were a real step forward, and in the Sierra E-Max 1600 Pinto a tentative step was taken toward Lean Burn combustion. However, the old designs could no longer cope with the pressure for more power, less emissions, lower fuel consumption. 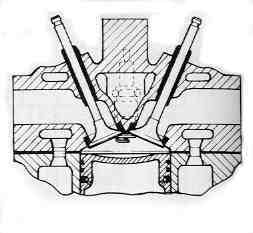 Today virtually every modern engine uses multiple valves for each cylinder, driven by two or more camshafts and almost all of them use the pent-roof design in some variation. The valves, canted at an angle of about 45% on opposite sides of the centre-line can have a much larger diameter and an excellent port shape is obtained. This gives high volumetric efficiency. Using two valves for the inlet and exhaust improves this still further, since the area of four valves will always be greater than two, and it is possible to combine good breathing and economy and low exhaust emissions. A look at the two DOHC2000 engines fitted to the Scorpio, the 8V and 16V, confirms this. Both engines have identical bore and stroke (86mm), both have compressions ratios of 9,8:1 and both have identical engine management (EECV) and contactless ignition (EDIS). The 8 valve delivers 115 PS at 5,500 rpm and the 16 valve 136 PS at 6,500 rpm while the torque is raised from 167 Nm @ 2,500 rpm to 175 Nm @ 4,200 rpm. These engines are a clear demonstration of the advantage of multi-valve designs. Four valve engines are known to achieve more stable combustion over a wide mixture range, and thus are suitable for lean-burn designs. Operating satisfactorily on ratios as little as 22:1 air/fuel, this is achieved by careful design of the chamber producing turbulence of the fuel/air mixture on the induction stroke. This turbulence continues until the last part of the compression stroke, when the main swirl motion is broken up into ‘micro-turbulence’ to just before the point of ignition, and it is this which enables the engine to run on very lean mixtures.